Welcome to Yorkshire!… Whether you are just visiting York or planning to explore more of what Yorkshire has to offer, often referred to as “God’s Own Country”, you are guaranteed one thing. A truly memorable stay! Steeped in history York station is the perfect gateway to the City of York and the county of Yorkshire. 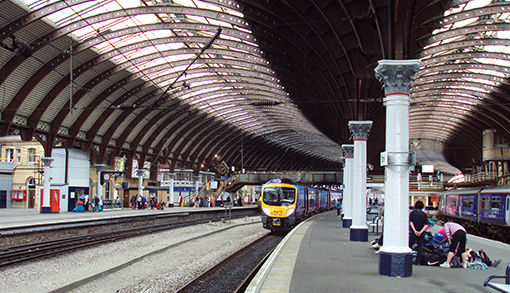 In 1841 York railway station was a wooden construction with just 2 platforms and a single archway through the surrounding wall to allow the trains to flow in and out of the city. The rail traffic quickly outgrew the station and in 1866 Parliament granted permission for a new station but that took another 11 years to be built. The first train departed the new station at 5:30am on 25 June 1877 destination Scarborough. The station was designed by architect Thomas Prosser and has since undergone various changes including extensive repairs after it was heavily bombed during the Second World War. The last major renovation took place in 2009 when platform 9 was reconstructed and extensive lighting upgrades were made. An additional line and new junction were added in 2011. The beautiful historic walled city of York has a plentiful heritage and been the backdrop to major political events in England throughout much of its two millennia of existence. 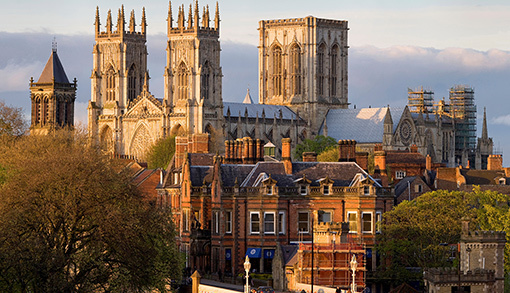 The city offers a wealth of historic attractions including the magnificent York Minster making it one of the most popular tourist destinations in the world. The city was founded by the Romans in 71 AD and named Eboracum. In the Middle Ages York grew as a major wool trading centre and became the capital of the northern ecclesiastical province of the Church of England. 19th century York was a major hub of the UK’s railway network along with confectionery manufacturing at its centre. In recent times York has become synonymous with food and drink, arts and culture, retail outlets, music and nightlife whilst York University and health services have become major employers.